Anna Wright has rapidly developed a following across the UK for her print, collage work and paintings, following in the footsteps of Emma Bridgewater, Tricia Guild and Liberty as she takes her designs across stationery and homeware. She is now embarking on her third picture book for children. Anna brings humour, beauty and sophistication to this perennially popular Christmas hymn, with her signature style. 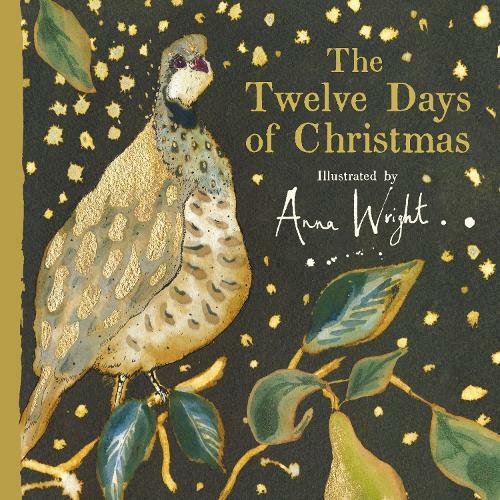 Exquisitely rendered in pen, ink, watercolour and collage, The twelve days of Christmas are beautifully and playfully reimagined for today's readership - and have never looked so sumptuous. Glints of gold foil on the cover image--a partridge in a pear tree--hint at the elegant mixed-media treats inside this reimagining of the eponymous Christmas carol. Wright (Magnificent Creatures) demonstrates a fondness for nature in her depictions, which feature animals in colorful, patterned, gold-accented swatches of collage. For all its sophisticated elements, the artwork captures a playful tone as well: five frogs twirl gold rings in fancy hula hoop style, 10 grasshoppers stand in for the leaping lords, and 12 woodpeckers represent drummers drumming. In another lighthearted interpretation, the eight maids a-milking verse is accompanied by an image of a pink sow nursing seven suckling piglets, as an eighth regards the reader from the page. Fans of the beloved carol, and readers just learning to count, will have something to celebrate here. Ages up to 5.